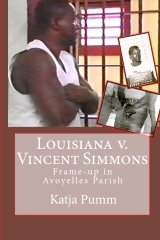 The book Louisiana v. Vincent Simmons: Frame-up in Avoyelles Parish is available in different book stores worldwide as e.g. Amazon. RETAILERS, click here to go with your code directly to the e-store powered by the publisher CreateSpace , please. READERS, make use of the coupon code 4KQEW9F and get US$ 3.00 off at CreateSpace! Country Bumpkin Judge Billy Bennett lost his son. Don’t you know it was punishment for all the children and families he has wronged in the name of corruption. How do you like me now you fat cow! Your a disgrace to your fathers name and legacy! !